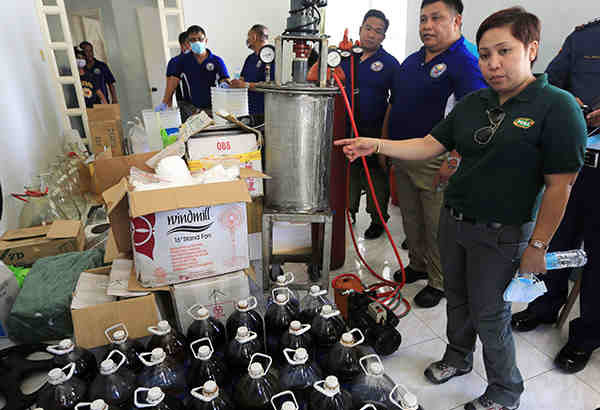 PhP4 billion worth of Shabu (methamphetamine hydrochloride) and drug ingredients were seized, while four people were arrested in a raid on a mega shabu lab and facility in Pampanga. The Philippine National Police's Anti-Illegal Drugs Special Operations Task Force and Philippine Drug Enforcement Agency conducted the raids, radio dzBB's Rowena Salvacion reported. Three Chinese were arrested in the first raid at Greenville Subdivision, one identified as Jason Lee. Several boxes of shabu were seized in the area. An initial inventory showed there were some 187 kilos of shabu seized from the subdivision laboratory. The drugs had an estimated street value of P2 billion. Also seized were 975 kilos of ephedrine, an ingredient used to make drugs. Merdegia said the ephedrine could be used to produce some 300 kilos of shabu in one week. A second operation in Barangay San Jose in San Fernando City yielded more than 100 kilos of drugs. Arrested was a Chinese woman said to be Jason Lee's wife. The report quoted PDEA head Arturo Cacdac Jr. as saying the raid stemmed from a tip on illegal drug operations in the area. It added the PNP and PDEA suspect the Chinese chose San Fernando City as their base of operations because of its easy access to the North Luzon Expressway. Mabuti nmn at natimbog na ang mga producer ng drugs na matagal ng gumagawa ng malaya sating bansa. If roxas new about drug dealing in davao city so as an interior secretary why in the hell did he not do anything about it.to those who are critisizing du30 anti illegal drugs campaign shows that they are really a protector of drugs lords and pushers. A lot of procastenated righteous peoples seek not to see the truth about the rotten system of few LEADERS IN OUR COUNTRY.MAY OUR EYES NOW BE OPEN AND BOLD ENOUGH TO STAND ON THE PRINCIPLE OF RIGHTEOUSNESS FOR THE SAKE OF THE NEXT GENERATION'S. Ang mga maliliit na pusher na ang nagturo sa mga yan kya nabisto at natimbog. Sabwatan yan ng mga matataas at maliit na pulis at ilang mga local leaders. Sa pampanga madaming corrupt na opisyal ng bgy. tama po kayo dyan mr. james marami pong corrupt na opisyales dito sa amin sa Pampanga. This production of shabu has been long done in our country. But because of the protectors whose ranks are untouchable, nothing really happened the past years. It's very clear and people are not senseless of what is really the truth of the matter. Hopefully with the leadership of Pres. Rody and Sir Bato, and of course with the unity, cooperation, and vigilance of every Filipino citizen, we can attain a better Philippines in general. God bless everyone! One way to go is to have an inventory of all these Chinese, etc (foreigners) in every locality. There should be a verification as to the 'real' businesses of these people. These are the people who are into the drug trade. We have them all over the country. What about those businessmen who have enriched themselves in the drug trade and are now legit businessmen? Govt should go after them too. They should pay for their 'sins'. inagaw pa ang scarborough shoals ng mga intsik,pinapatay pa ang kababayan nating filipino,dapat lang bitayin na ang mga yan!pati yong protector sa mga druglord. I bet my two cents. This drug biz of the Chinese in the Phils is a part of a master plan to saturate the country with drugs and make the majority of the populace paranoid before a massive invasion of the country. This is the very same strategy deployed by the Japanese before Ww2. They drugged the Chinese massively and when the war broke out they just walked-in to China with no problem. The Chinese communist gov't cannot be trusted as they could be angelic today and be an aggressive demon the next day. For now,the international opinion is in favor of the UNCLOS decision and is gaining momentum that even France is participating in the scenario and be highly visible in the patrol of the WPS also the reason the Chinese President mellowed on his latest statement and almost very diplomatic to convince Digong for a unilateral dialogue about the WPS. India, one of the strongest naval force in Asia is joining very soon along with the 7th fleet of the U.S. naval force. Still the future of the WPS is still on the shoulders of the RP administration under Digong. As patriotic as we are, we need to support President Digong instead of displaying our mixed emotions regarding the issue that sometimes we lost focus of our rationale. Hindi tayo pababayaan or ipapahamak ni Digong, sigurado ako.